More shoes will be bought this Tuesday and distributed in February in Kenya. This was a personal project in which friends contributed funds in order to purchase shoes for people who needed them the most in both Kenya and Uganda. If you want to more about it, read Oct 21 and 29 entries. A few of you wanted to know how else you could help, since enough money had been collected for shoes. Thanks for the additional funds, which were used to pay for tuition, food, books etc, for a year for children’s education. While, Kenya has implemented Free Primary Education, there have been issues that have arisen, that perhaps were not forseen. The children that have been supported with the donations are going to schools where the fees are nominal, but some of the issues experienced in the public system, are not present. In the first year of the introduction of FPE, enrollments jumped by 22 percent. Students in large numbers enrolled into schools across the country, causing class sizes to increase. Schools became overcrowded and the conditions, unbearable; not enough toilets, water or good lighting to accommodate the students. In addition to this, resources were lacking which meant students had to share textbooks and desks. Teachers were not sure how to cope with the large class sizes and training was not provided to better handle this situation. Free Primary Education means that families are no longer responsible for paying the yearly tuition for their children. However, in addition to tuition, there are other costs associated with going to school. Students are responsible for their uniforms, textbooks, and transportation. These costs can amount to a lot for one family, especially if they have several children to educate. Parents will also consider the cost-benefit ratio. Does it cost more to send a child to school than the income that he or she provides by working on the farm or in the fields? These are just some of the issues that the education system is facing. If you would like to put a child through school, let me know. People are sometimes hesitant to donate to an organization, unsure of whether or not 100% of funds will go where they are supposed to. 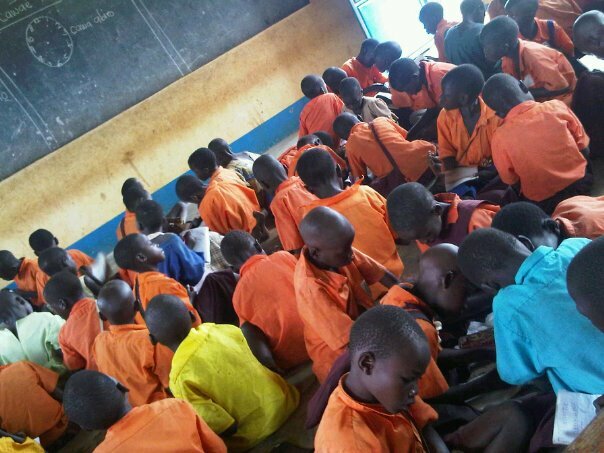 The schools are paid directly by a contact person that I have in Kenya and this fundraising is not connected to any organization- again, a personal project – so all the monies go towards educating children. Below is a picture of one of the classrooms that I visited on a recent trip.